Trend doesn't seem to sell this any more. 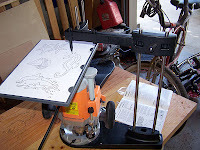 It's the "RoutaSketch" and I picked one up on clearance at Rockler for $25. It was when they had the coupons 50% off any clearance item. 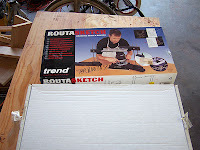 They had two of these RoutaSketches, original price $99, clearance price $50, with my coupon $25. I figured for $25 it was worth checking out. I was intrigued by the concept, that's for sure. Inboxed, it's clear the thing was made as cheaply as possible. All plastic except for a pair of brass thread inserts in the base and the steel bars to hold up the template and the tracing stylus. 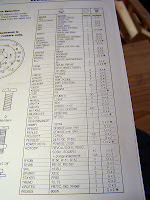 I assembled according to the directions. The steel bars were a REALLY tight fit in the plastic bases. Tight enough I feared I'd break the plastic before even getting to try it. But they survived. The plastic may be tougher than I initially thought! 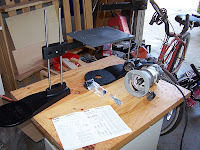 After assembling the stands I looked at the instructions to determine which holes in the base to use for my Porter Cable router. But, alas, there were no PCs listed in the table! No Porter Cable support? How can this be?!?!?! I suspect that maybe PC isn't as big in Europe as it is here in the US. Trend seems to be based in the UK. That might explain it. I tried to line up the holes in my PC with the myriad holes in the base of the Routa Sketch. No luck. None at all. Bleh. I decided to grab the Harbor Freight plunge router that's been pretty much setting on the shelf. Sure enough, the template holder screws were a match. In fact, Trend was nice enough to include long screws that fit! 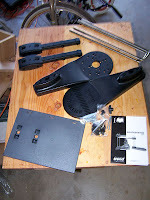 A good thing since the ones that came with the router were far too short to mount the RoutaSketch base with. 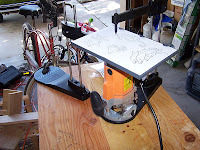 After some dry runs making sure I had the motions down and was comfortable controlling the router with this big thing attached (really it isn't that bad, things moved quite smoothly) I picked one of the designs that came with the RoutaSketch. The RoutaSketch comes with a good assortment of line art to use. Oddly enough (or maybe not), at least a few of those are public domain line art. My wife saw one of them at the local library for the kiddies to color! With the paper on the tracing platform, my plunge router dialed in to make a very light cut, and my daughter and I wearing goggles, I started cutting. Another thing that was irritating me was the stylus would grab the paper causing the paper to move. Well this screws up the pattern being cut into the wood. It turns out that the package came with a sheet of acetate to lay over the paper so the stylus moves more smoothly. Even so, I thought it came out pretty decent! I just carved into the mini-bench top. Don't worry, I'm not damaging my work surface. I had enough damage to it already that I need to resurface it with my jack plane. I didn't carve any of the details. This was more a test of the tool. It's not a project. The outline looks good, but you can see where the aper shifted. 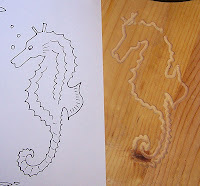 it shoved the sea horse's forehead into it's ears. The acetate should prevent that from happening next time.